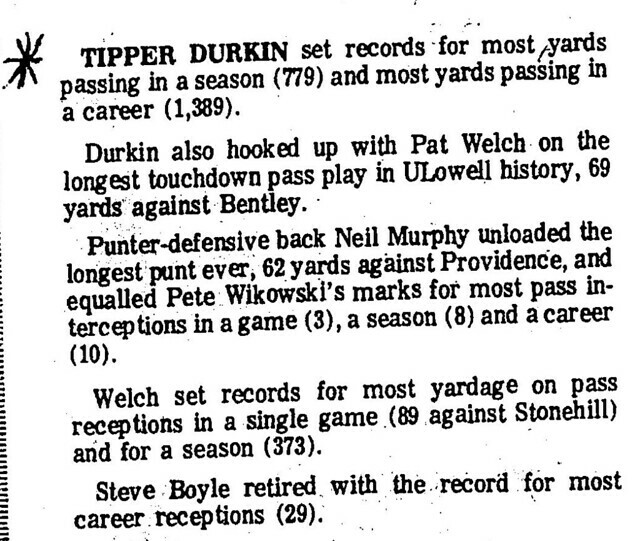 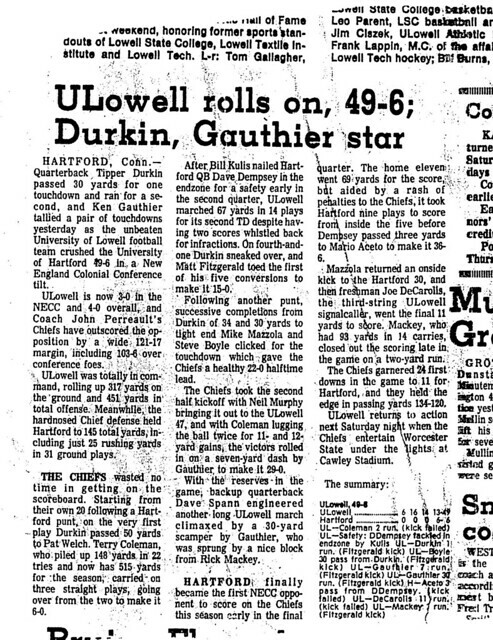 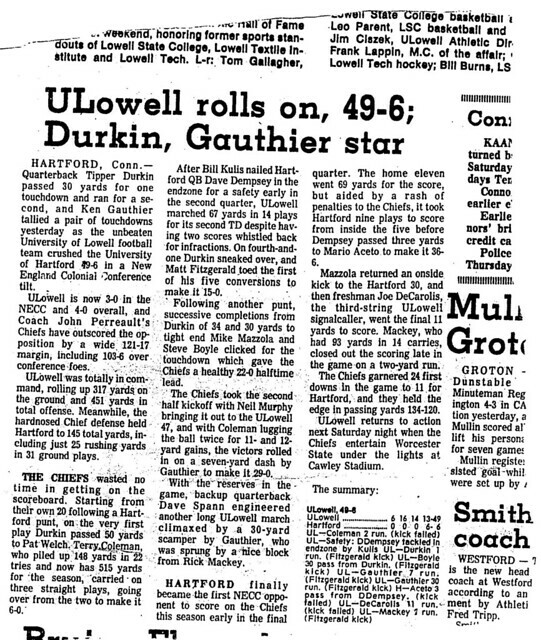 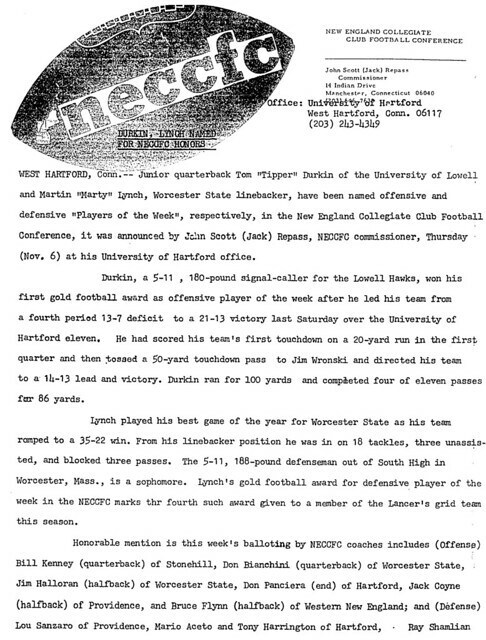 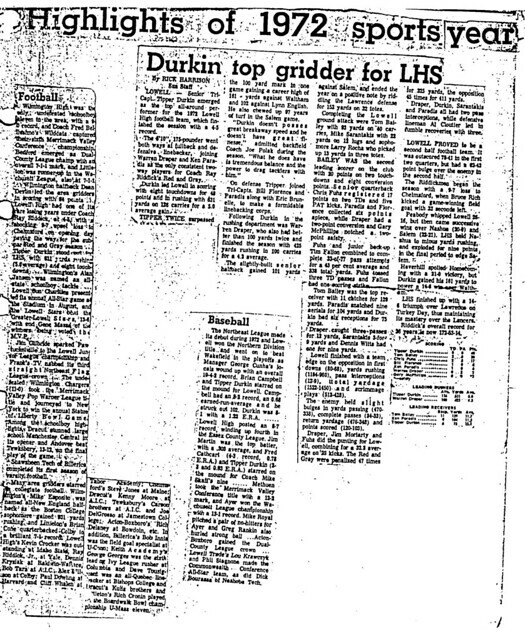 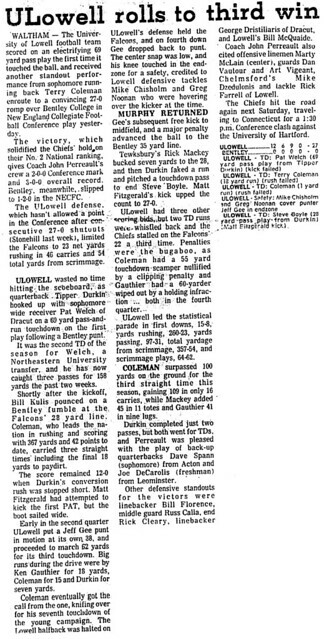 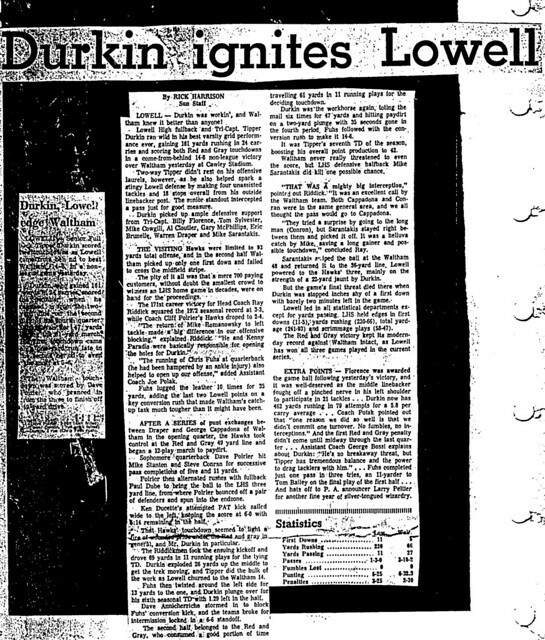 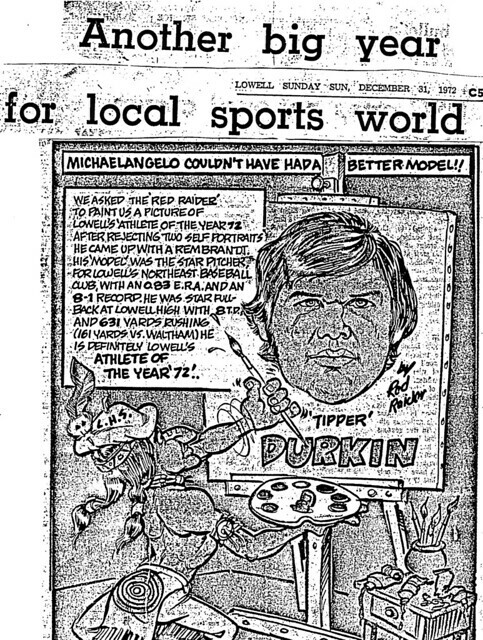 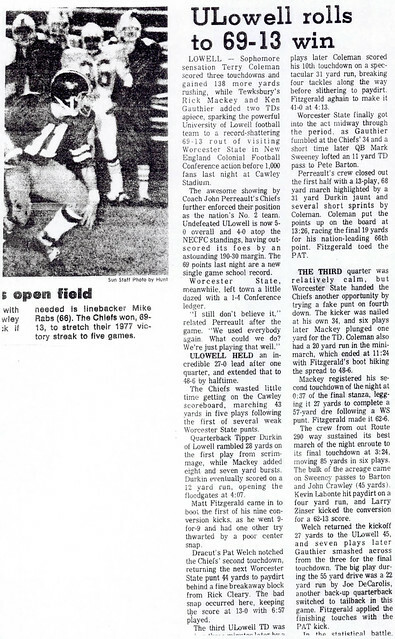 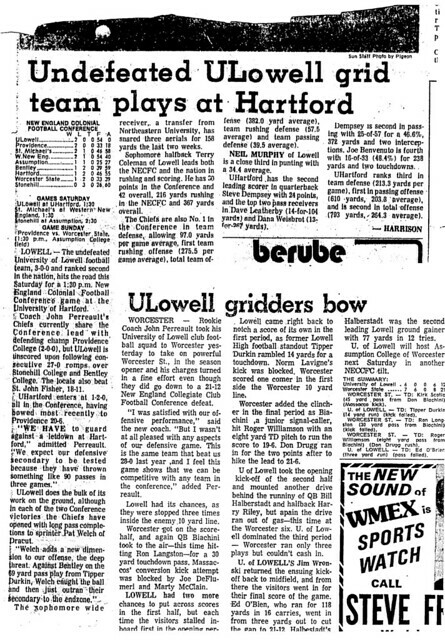 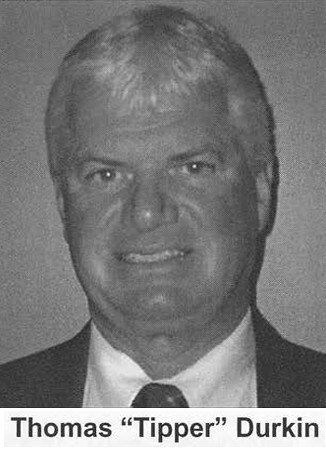 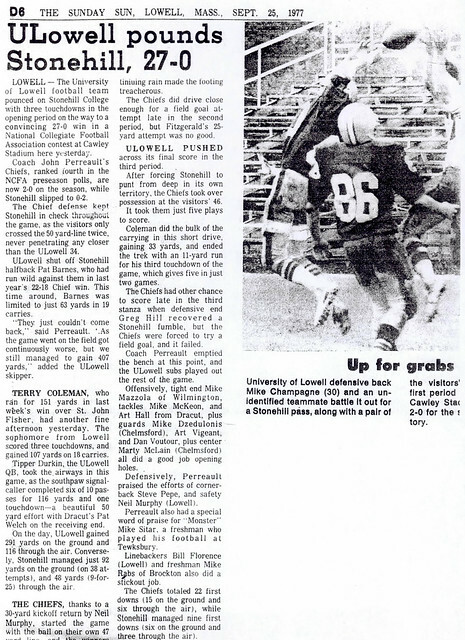 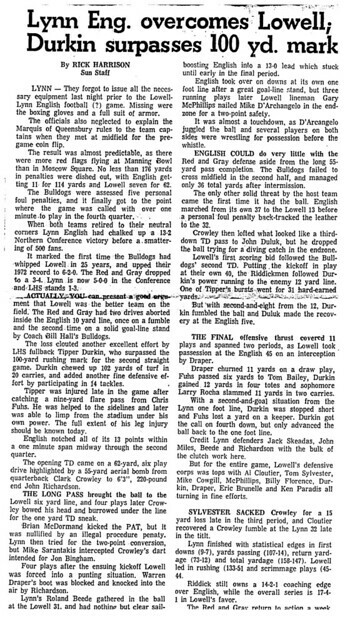 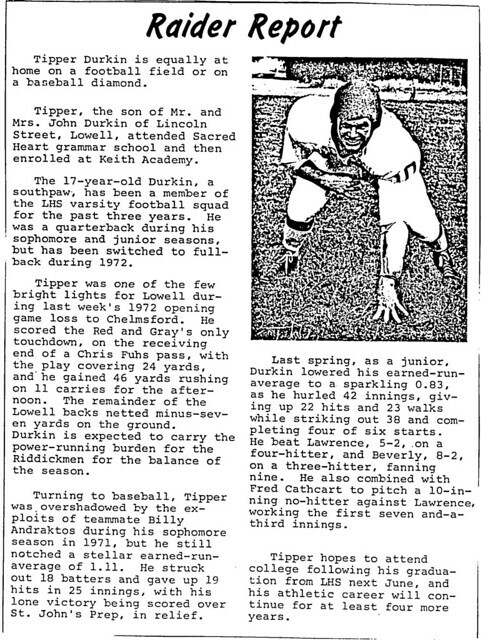 A multi-talented athlete, Thomas “Tipper” Durkin earned distinction on the football gridirons and the baseball diamonds at both Lowell High School and the University of Lowell during the 1970’s. 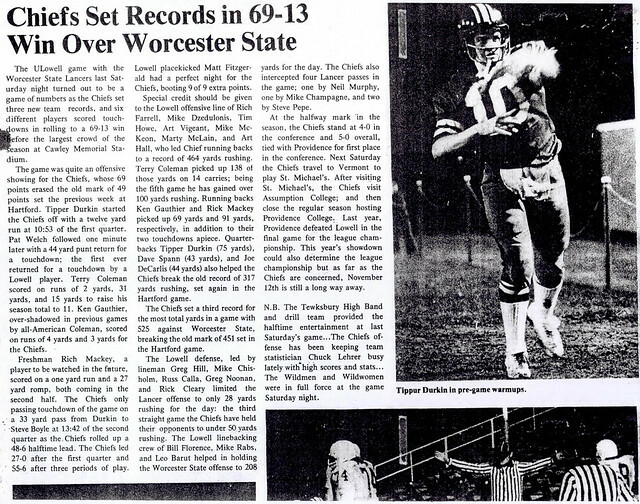 Tipper displayed impressive versatility as a member of legendary Hall of Fame Coach Ray Riddick’s vaunted Lowell High School football program. 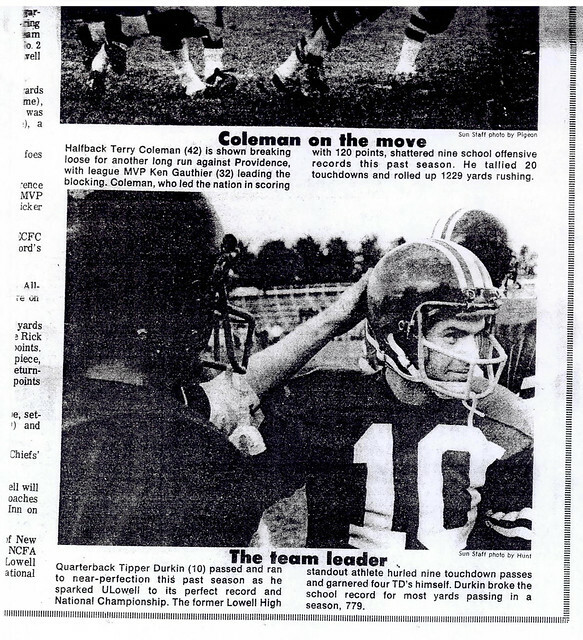 After playing quarterback during his sophomore and junior seasons, Tipper moved to the fullback position on offense while also starting at linebacker on defense as a senior in 1972. 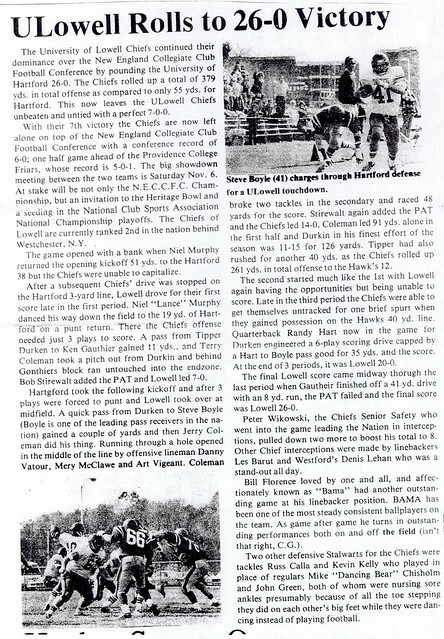 A team Tri-Captain, Tipper was the team’s leading offensive performer, leading the Red and Gray with 631 yards rushing and 8 touchdowns. 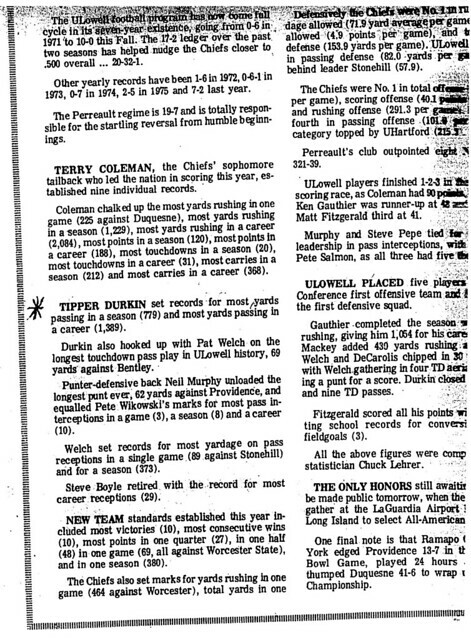 An outstanding 2-way player, Tipper tied for the team lead in interceptions with 4, as making countless tackles from his linebacker position. 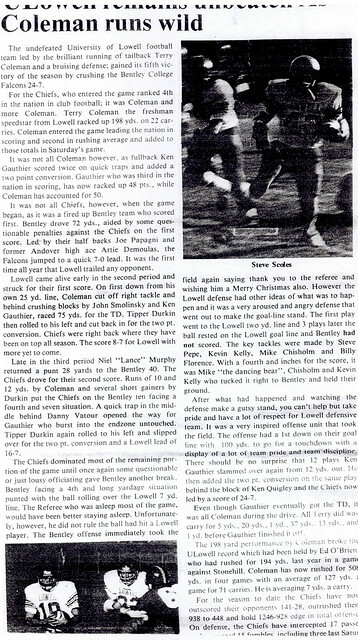 His finest effort came as he rushed for 161 yards and scored both touchdowns in a come from behind 14–6 Raider victory over Waltham. 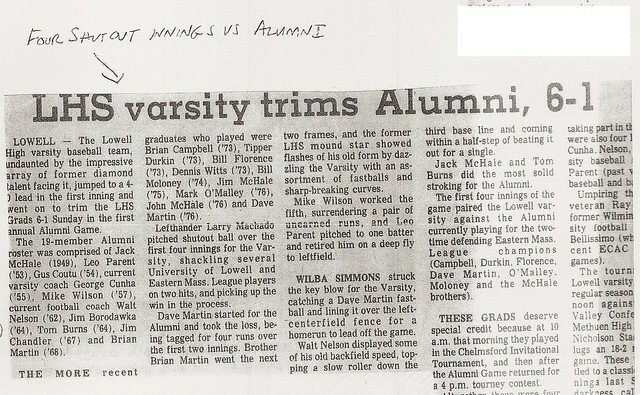 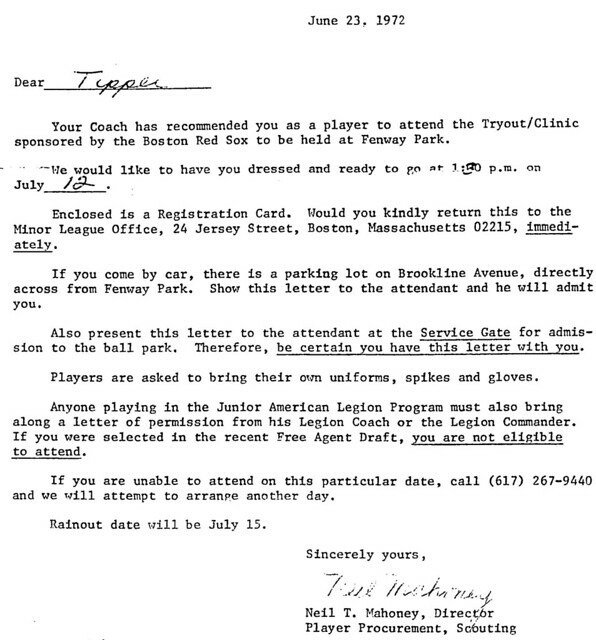 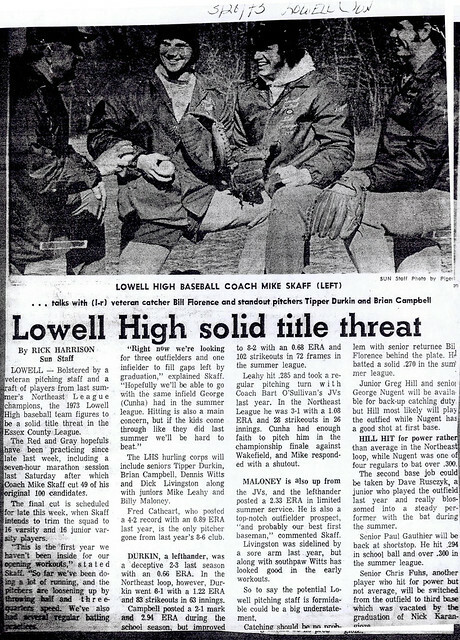 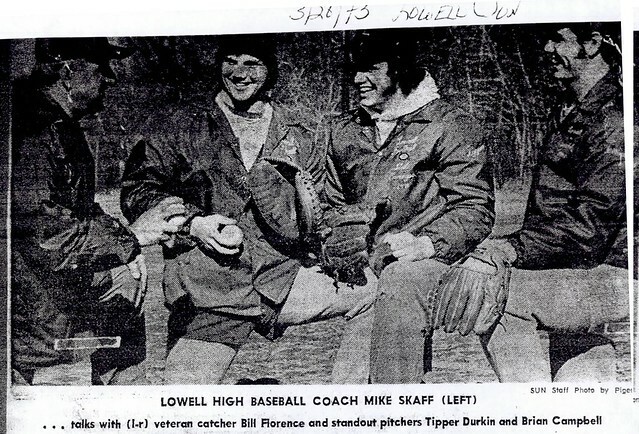 As a member of the Lowell High baseball, Tipper developed into a reliable starting pitcher. 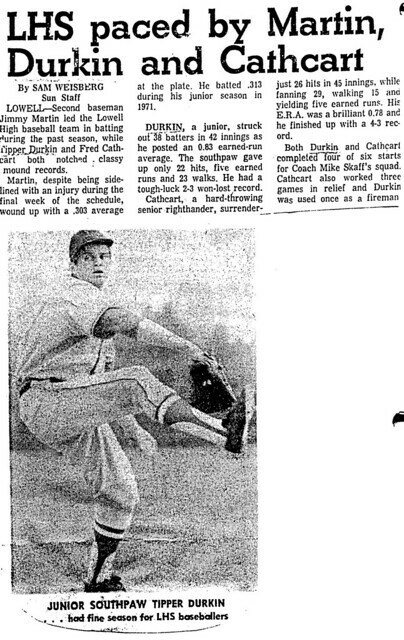 As a junior (1972) the southpaw hurler compiled a miniscule ERA of 0.83 while leading the team in strikeouts with 38. 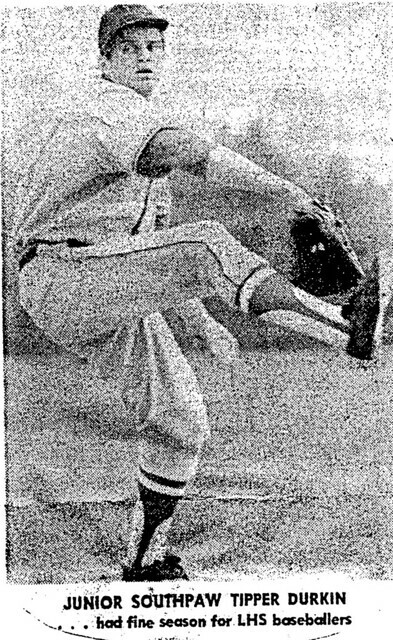 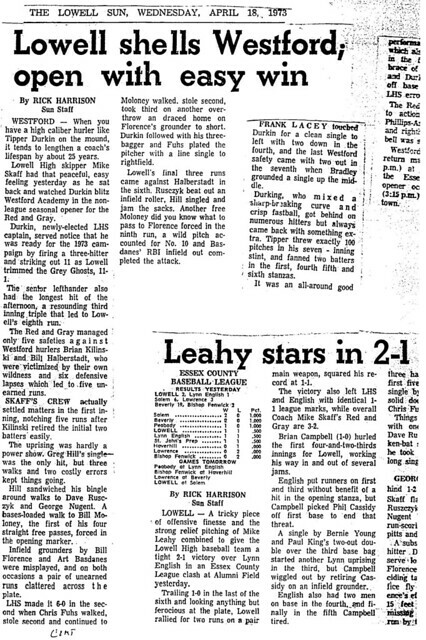 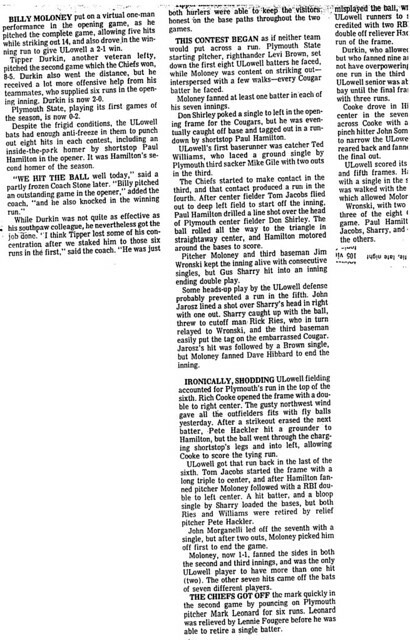 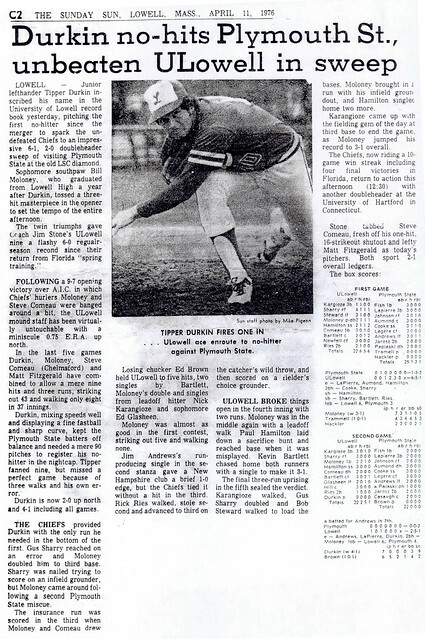 Tipper combined with teammate Fred Cathcart for a 10-inning no-hitter against Lawrence. 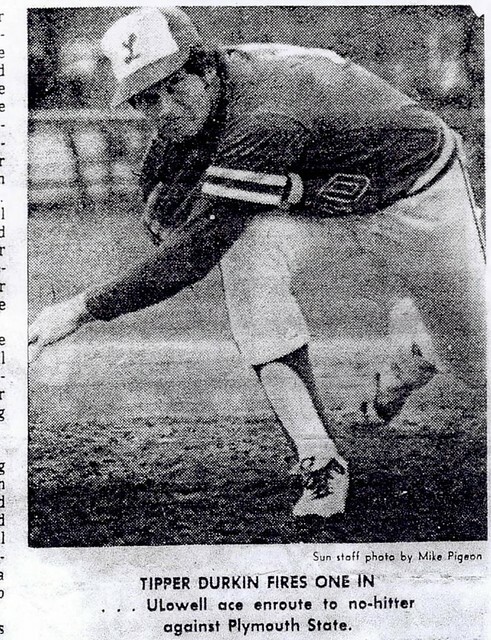 The workhorse of the 1973 team as a senior Captain, Tipper led the Red and Gray with 52 1/3 innings pitched and 78 strikeouts. 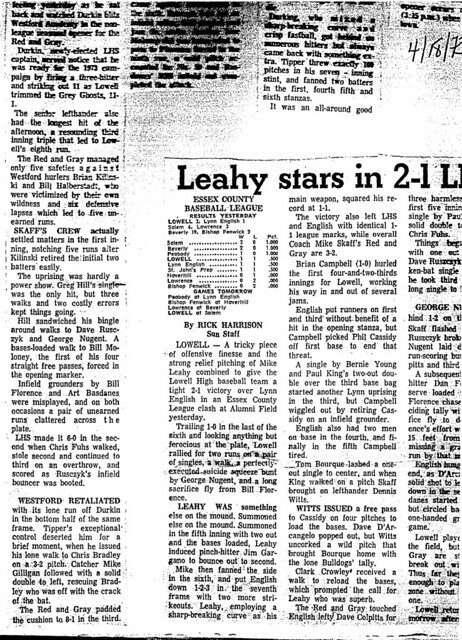 He also compiled a fine 1.88 ERA. 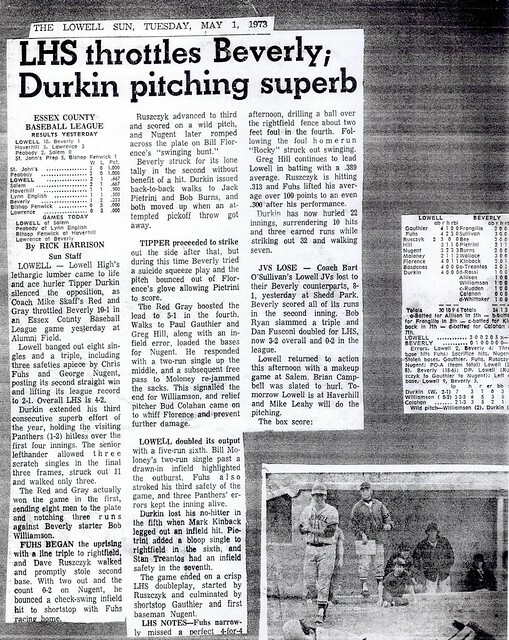 In a memorable effort, he struck out 15 batters against traditional powerhouse St. John’s Prep. 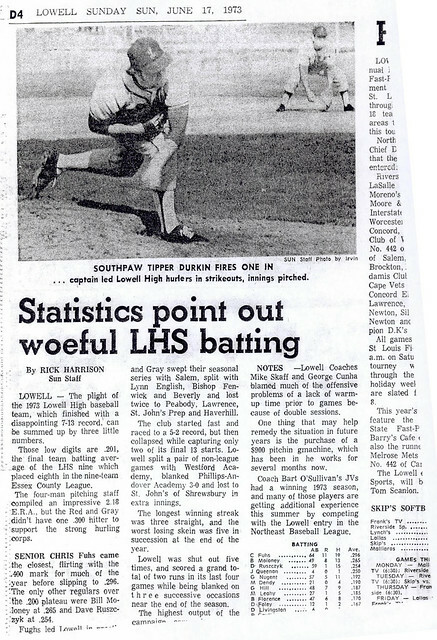 His career ERA of 1.35 ranks high among all LHS pitchers. 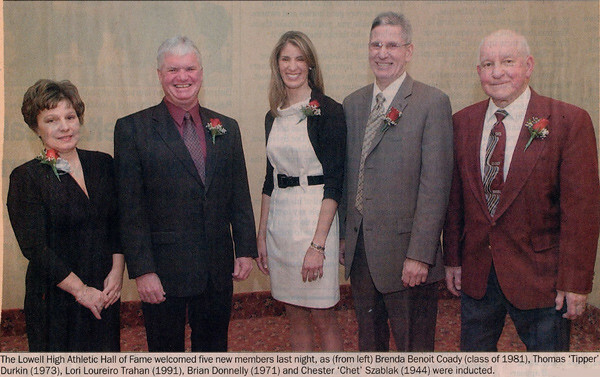 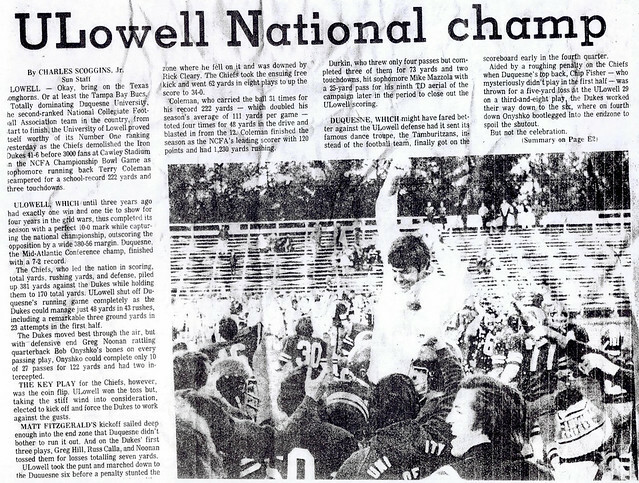 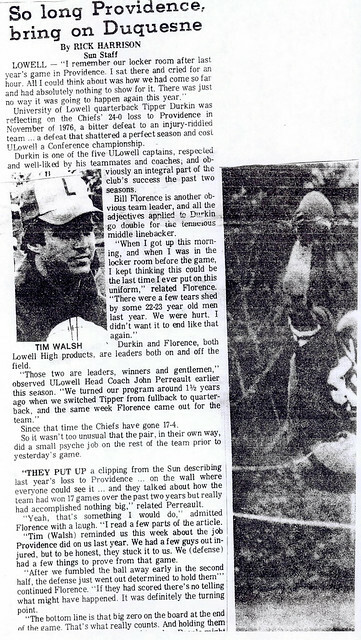 After graduation, Tipper enrolled at the University of Lowell and established himself as one if the University’s all-time outstanding all-around athletes as a quarterback on the Chiefs club football team and a pitcher on the baseball team. 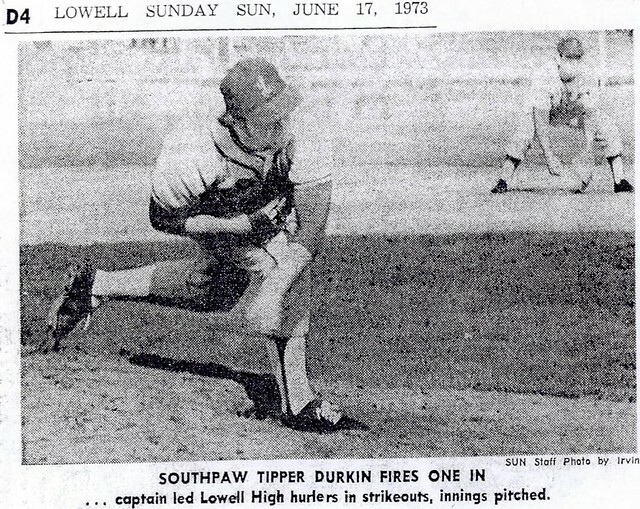 Tipper was the Captain of both squads. 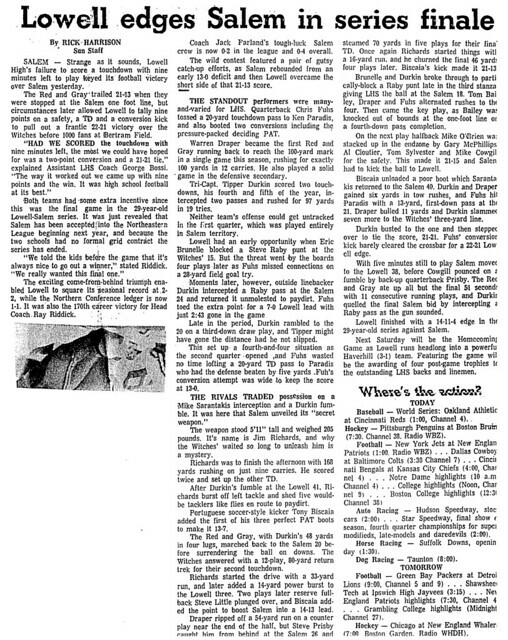 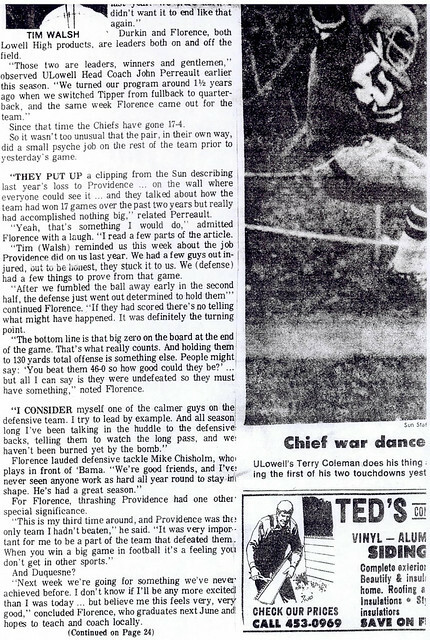 Tipper was the offensive catalyst for the Chiefs football squad, which outscored its opponents 380–56 en route to an undefeated season, culminating in a 41–6 victory over Duquesne University at Cawley Stadium to win the National Championship in the National Collegiate Football Association in 1977. 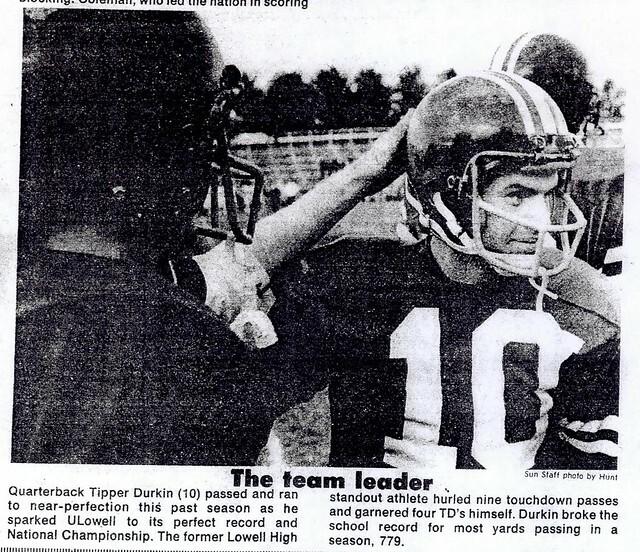 Tipper, who threw 2 touchdown passes in the title game, earned 2nd team All-Conference honors for a season that saw him throw for 779 yards and 9 TDs and rush for 4 more scores. 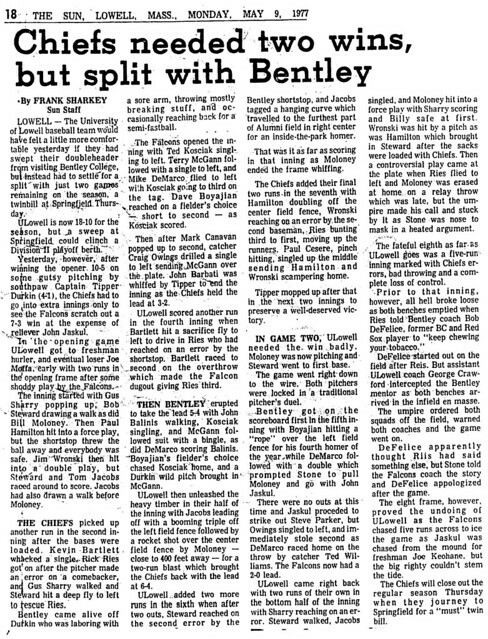 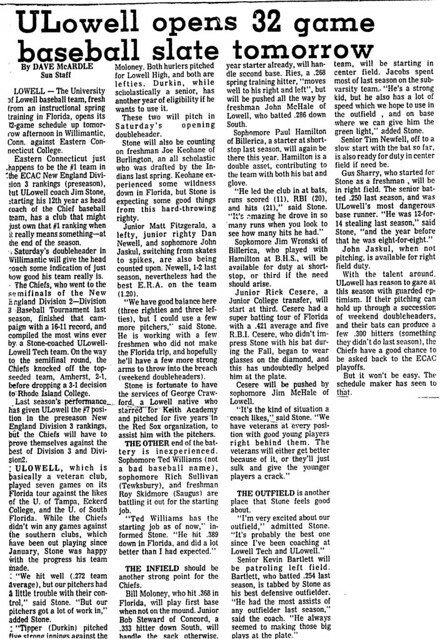 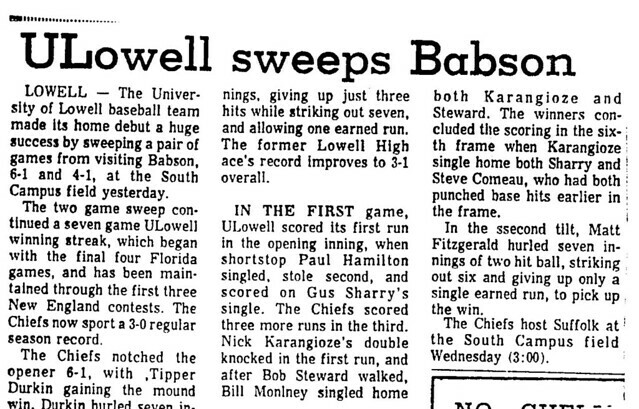 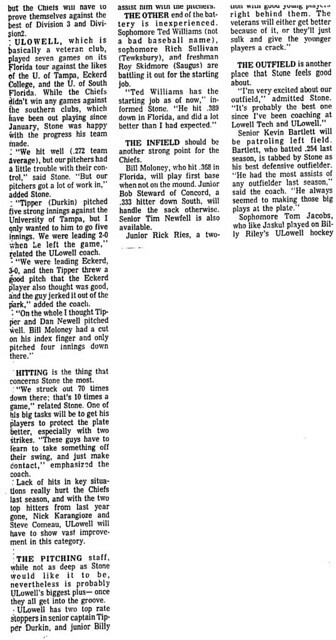 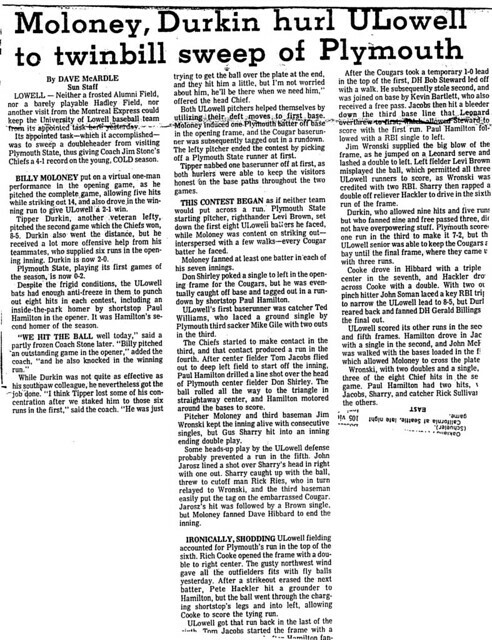 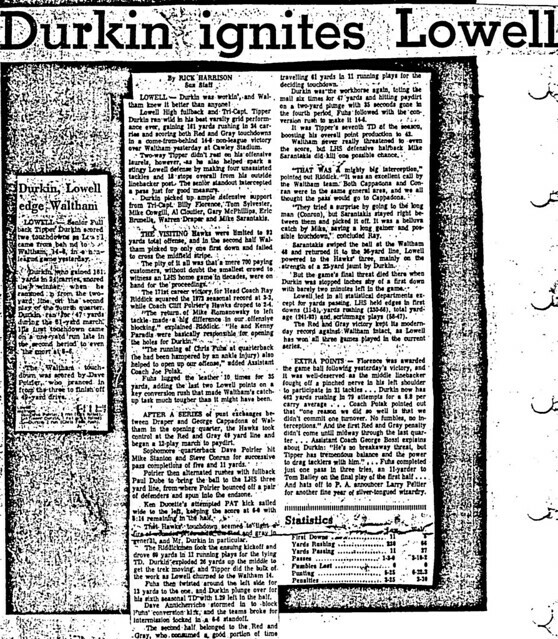 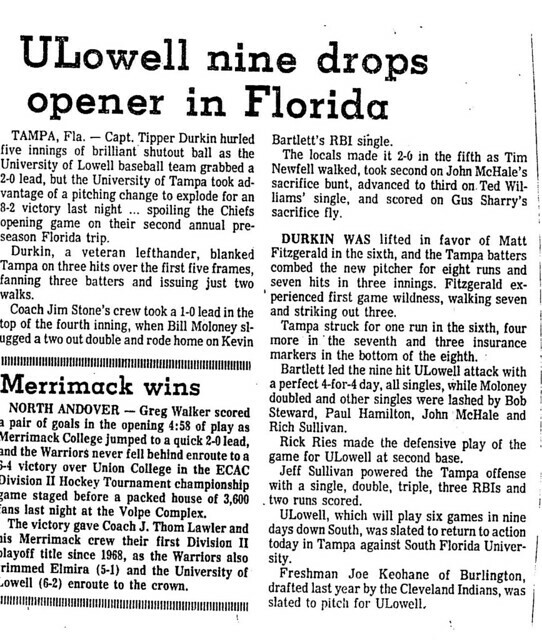 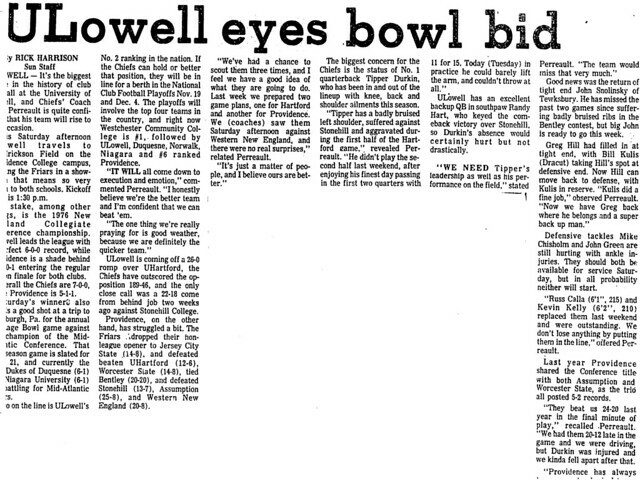 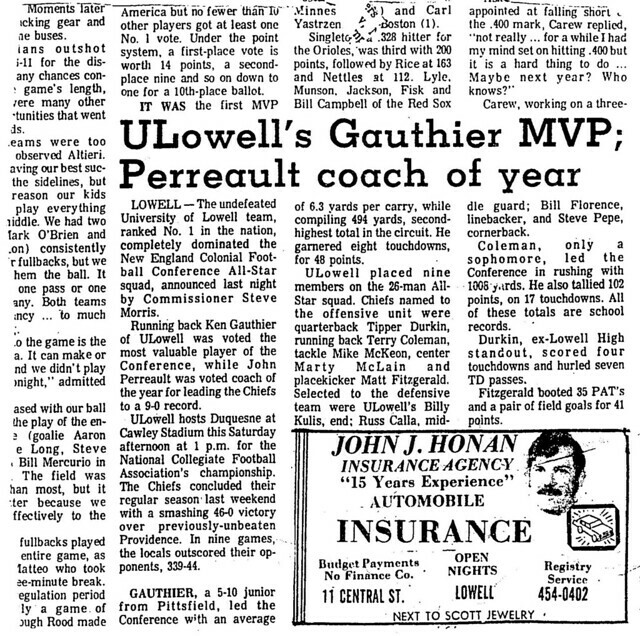 As a member of ULowell’s baseball team Tipper developed into one of the program’s top pitchers, combining with another ex-Lowell standout–Bill Moloney–to form a deadly 1–2 combination on the mound. 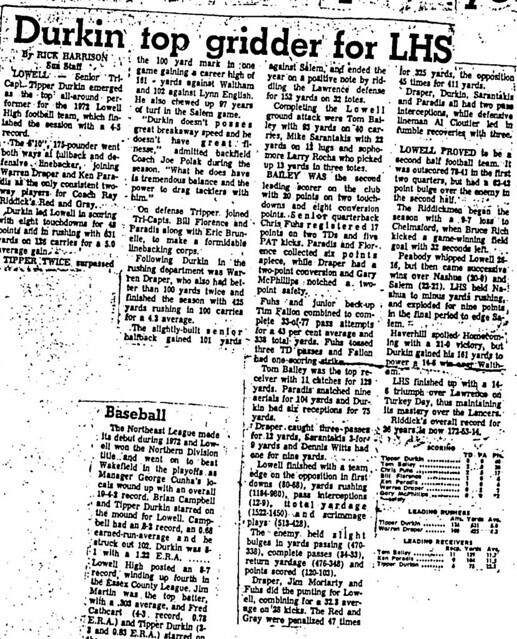 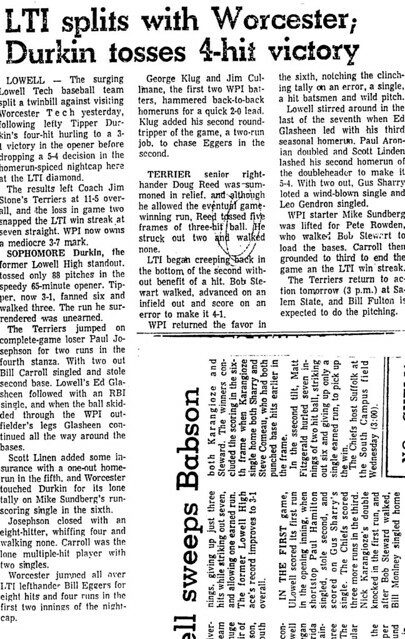 Tipper pitched the 1st no-hitter in the University’s history against Plymouth State in 1976.